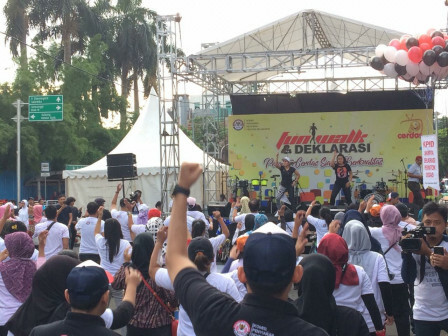 " We want people to be able to sort and choose quality television shows or radio broadcasts"
1,000 people are seen crowding the Fun Walk and Broadcast Intelligent Viewers Declaration event initiated by the Jakarta Broadcasting Commission (KPID). Central KPI Chairman, Yuliandri Darwis stated that it is hoped able to spread the spirit to make everyone aware of being a smart society by being able to choose good broadcasts. "We want people to be able to sort and choose quality television shows or radio broadcasts," he disclosed, Jalan Imam Bonjol, Menteng, Central Jakrata, Sunday (12/16). He explained that KPI as the regulator also invites broadcasting institutions, either television or radio, to always be a trusted source of information. "Broadcasting institutions certainly need to do more literacy. Thus the news and information delivered is more accurate and reliable," he explained. Jakarta KPID Chairman, Kawiyan uttered that broadcasting institutions must have the concern to present quality shows and educate. "Quality shows, one of which is informative shows that can be verified," he said. The more intelligent society, broadcasters will present good and quality programs. Central Jakarta Mayor, Bayu Meghantara appreciates the steps taken by Jakarta Provincial Government to educate the public through quality information and impressions. "This is my appreciation for friends at KPI as a regulator," he stated.